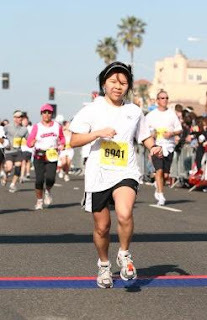 As part of the California Dreamin' Race Series, which will require me to run this race, the San Francisco Half-Marathon, and Long Beach Half-Marathon within the next two years, I ran this half-marathon in Huntington Beach again. Let me first off start by saying that in spite of everything I am about to mention, I kept thinking, "At least it isn't raining." So after some delays and almost forgetting my Garmin, we headed over to the race at 5:30 AM and just like last year, did not get to the start line until 7:50, five minutes past the first-wave start. For a race that expanded, they sure did not accomodate them with extra parking spots. Fortunately, there were sti ll many people who had not yet begun, so our late selves blended in just fine. I started off the first mile with my sister and "The Ukrainian," finishing in about 9 minutes. Once the initial crowd thinned slightly (though the field was pretty darn crowded the entire time), I teetered between 9-ish minute miles and 8:30-ish minute miles. I finished the first three in the pretty much same time that I clocked in at UCLA's 5K last year. The next few miles were rough on my quads as we went uphill. These miles basically demolished any leg power I had for the remainder of the race. After mile 5, I was getting soooo tired and heavy-legged. I guess that's what happens when you don't train enough. I was still hoping to come in under 2 hours, but with all the stops I made, I should be thankful that I didn't do much worse than I did. The last mile was tough, as basically between miles 8-13, you are running a straight shot whence we came, which is traumatic psychologically. I barely had anything in me to sprint the last .1 mile, but I did, coming in at 2:03. This is a weird outcome for me, since typically I either run sub-2 or around 2:10. This race has made me very nervous about my upcoming marathon, as I know I have lost a lot of endurance due to lack of time to train. The only reason I didn't do much worse today was because I have developed a lot of new leg speed due to me rushing through my training when I can get to it, as well as my bike-riding (both the one in the gym and my actual one). This race looks great! I'm hoping to get us an entry for a winner in the HBBC challenge! 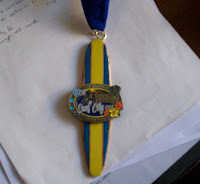 I ran the Surf City half marathon last year and the weather was AWFUL...it was my first half, too!